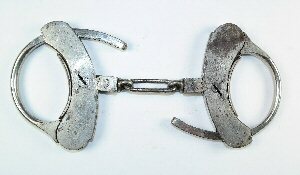 A nicely plated Adams handcuff with the June 17, 1862 patent date only. A standard Adams with both patent dates, April 24, 1862 and June 17, 1862. This Adams shows a common fault. One bow was made with inadequate grooves cut into the metal. New deeper grooves were cut across the bow to make the cuff work. A standard Adams with the Patent Applied For marking. 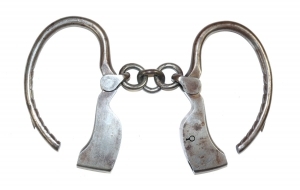 This Adams handcuff was likely damaged and then made into a cut-away to reveal the simple mechanism of the cuff. 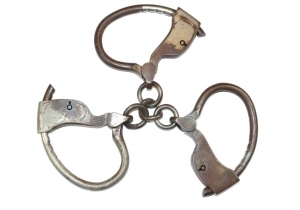 These are Tower Bean handcuffs, but they are marked Barnard. Barnard is likely a police supply house. This is an earlier model with a raised lock. 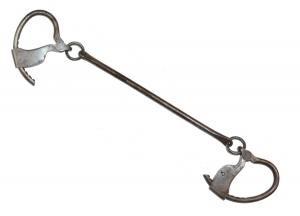 This early model has a raised lock with an unusual circular tradmark. This is likely a very early version of the Bean Cobb. It lacks the dimple that normally surrounds the lock button. 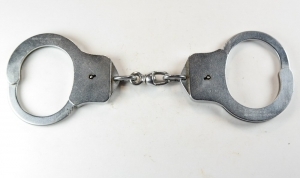 This is not a handcuff, at least not yet. It is brass prototype or model of a standard Bean Cobb. There are no locks and no grooves cut in the bows. A nicely plated example of a standard Bean Cobb. This Bean Giant is marked with the Nov, 1, 1887 patent date. This is a single Bean Patrolman on short leader chain. This is a nicely plated example of a Bean Patrolman. This Bean Patrolman has a strange linkage with two small links. 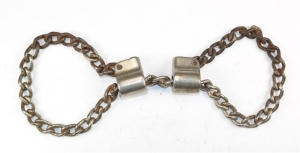 This Bean Patrolman has been modified with a short chain taking the place of the normal swivel. This is the heave Bean model. 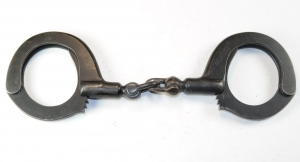 A nice example of a Bean Prison handcuff. The Bockin was patented in 1924. It is an early swing through handcuff. 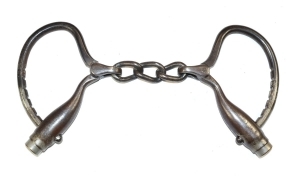 This model has the swivel held to the cuffs with chain loops. 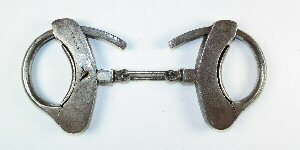 The Bockin was patented in 1924. It is an early swing through handcuff. 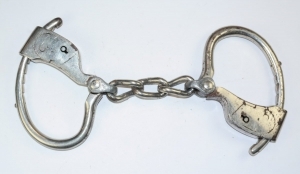 This model has the swivel held to the cuffs with swivels. 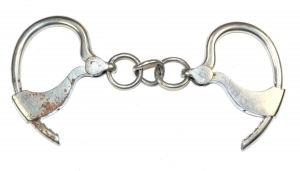 This is the Burdick chain handcuff, patented in 1903. The Cavenay bottleneck was a 20th century copy of the Marlin bottleneck. 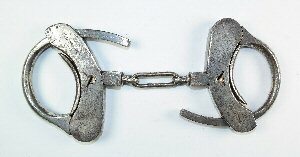 The Cummings handcuff was patented in 1899. It was made by the Dawson Machine Co. This is the first model of the H& R Super. This is the original model of the H&R Super. This is the second model of the H&R Super. It has grooved cut into the bow. This is blackened version of the H&R Super. This version of the H&R Super has extra links in its chain. Two blackened H&R Super connected with a long chain. This is the last model of the Bean Cobb. It was made my Harrington & Richardson and has two chain loops instead of the usual since loop. 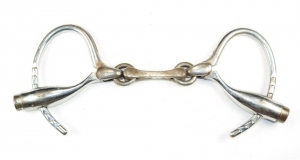 This is an H&R Super on a long chain leader. 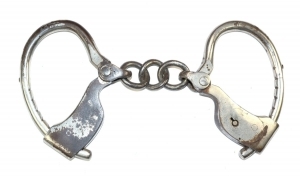 The Harvard handcuffs were cheap cuffs from the WWII era. 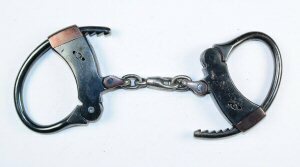 Most Harvard handcuffs are black. 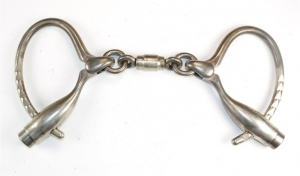 This is a Harvad handcuff has a long swivel and a wider than normal cheek plates. This has the effect of making the cuff smaller. 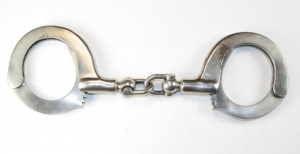 This Harvard cuff has an extra long swivel. 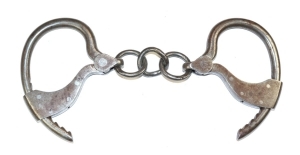 This is the second and final model of the Harvard handcuff. It was made in the early 1950s and was not a big seller. 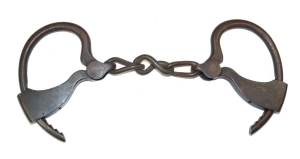 This is the Lovell version of the popular Bean Prison cuff. This version has been repaired and now has a double loop linkage. 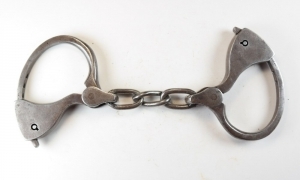 This is the standard Lovell version of the popular Bean Prison handcuff. 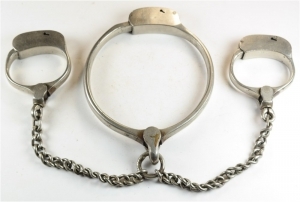 A rare factory made Maltby three-way cuff. This is the first model of the Marlin Daley bottleneck. 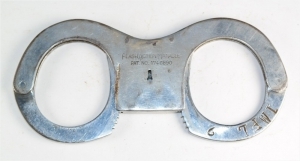 This is the last model of the Marlin Daley Handcuff. 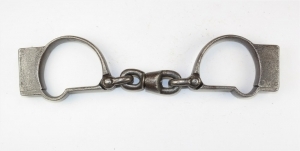 It has barrel swivel instead of the more usual three ring linkage. 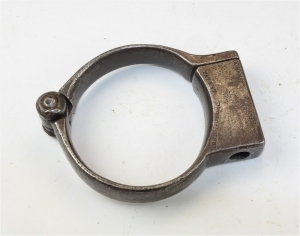 Mattatuck handcuff - possible prototype - No part matches a normal set. Only known example. 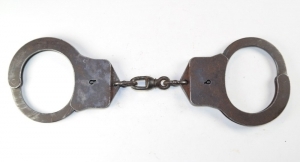 The Palmer handcuffs are truly different. 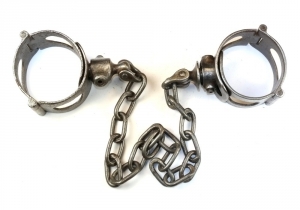 The two cuffs had a male and female side that plug together or with a chain. Once plugged together they need a screw key to open them. 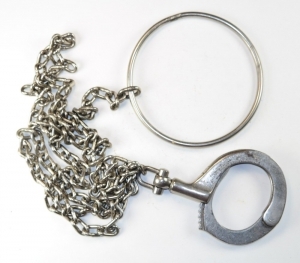 The Palmer handcuffs could also be mounted on a chain. This is the only true American Darby. 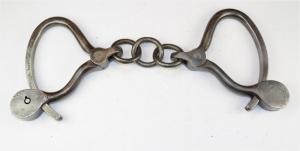 Made by Providence Tool Co of Rhode Island during the Civil War. 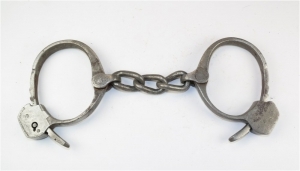 The Rankine handcuffs was patented in 1866. 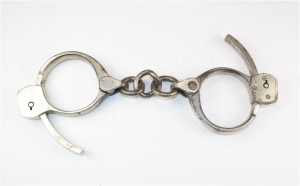 The Romer handcuff was patented in 1880. It basically is a large padlock on a chain. 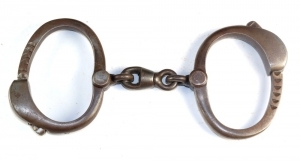 The Tower Bean handcuff was a lightweight handcuff produced in response to the popular Bean-Cobb handcuff. 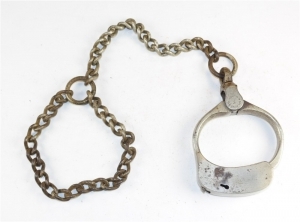 This is the earliest Tower handcuff with the keyhole on bottom of the lock case. 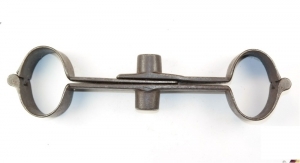 An early version of the Tower Bottom Lock. 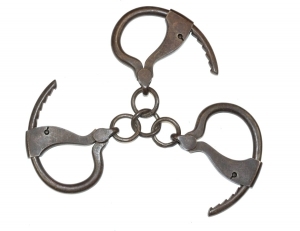 This later version of the Tower Bottom Lock has the familiar three ring linkage. This is a nice plated example of a Tower Bottom lock. 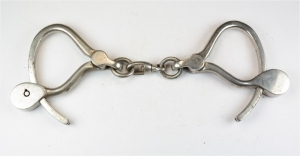 This is a rare example of a Tower bottom locking handcuff mounted on a bar instead of the normal chain or three rings. 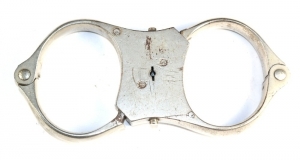 This is a vintage copy of a Tower Handcuff. 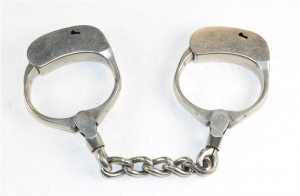 It is not know where these cuffs come from. There are two variations. 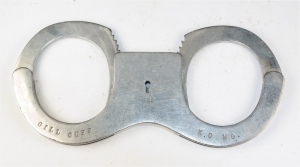 This is a vintage copy of a Tower Handcuff. 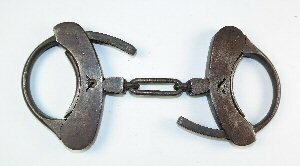 It is not know where these cuffs come from. 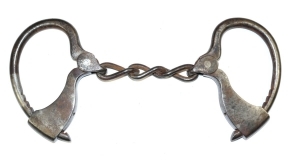 This variation has a chain linkage. 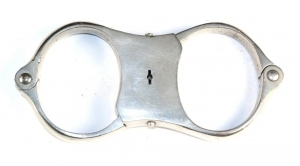 The Tower Detective was a simple light weight cuff that was designed to be carried in ones pocket. This is a vintage copy of a Tower Detective. 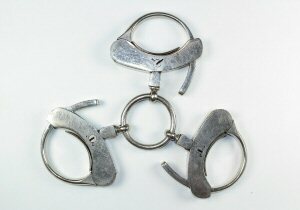 These copies of the light weight Tower cuff came in many variations. 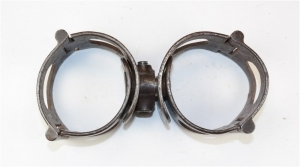 A copy of the popular Tower Detective handcuff. This is crude copy of the light weight Tower Detective with a chain between the cuffs. 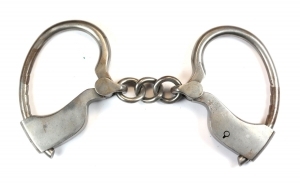 This is a nice example of a Tower double locking handcuff from the 1880s. 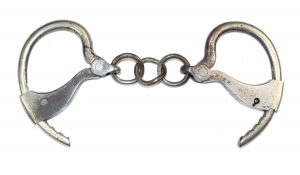 This is fine example of a Tower Double Locking handcuff. 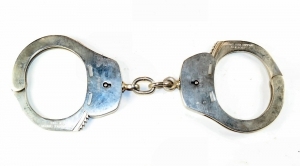 There are very high quality and very secure cuffs. 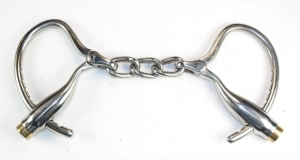 These are nicely plated Tower Double locking cuffs with a single loop linkage instead of the earlier three linking rings. 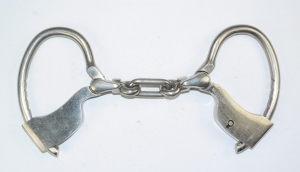 This Tower double locking handcuff has a long bar instead of the normal swivel. 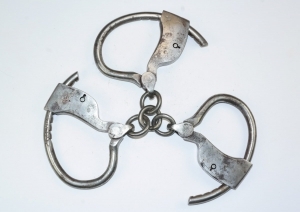 This is a rare Tower Double Lock Three-Way handcuff. 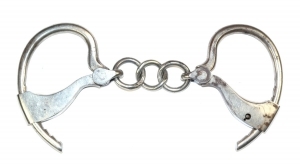 This Tower double locking handcuff has a set of stops on the bows. These stops need to be depressed for the bows to close. The Tower single locking cuff brought the key hole to the side of the cuff. 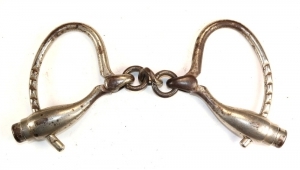 This version of the cuff has the key hold in a slightly slanted position. 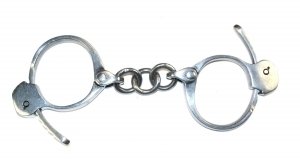 This Tower single locking handcuff has a set of extra short bows. The normal bows have been expertly shortened to make a smaller than normal cuff. 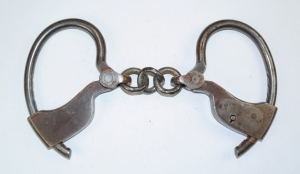 This is a rare pair of Tower Single Locking handcuff on a short bar.